HCM CITY — The HCM City Conservatory of Music has linked up with an education organisation to try and popularise classical music. 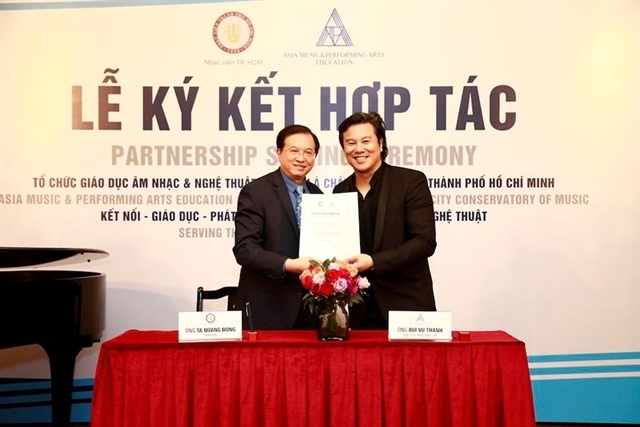 The conservatory’s director Tạ Quang Đông announced it would be working with Asian Music Education and Performing Arts Organization (AMPA Education) after signing a deal with the group’s representative Thanh Bùi on April 9. “I realise that to find music talents we need to encourage high school students to get to know more about music and develop music lovers,” Đông said. “Additionally, HCM City Conservatory does not only teach professional music but it will be responsible for bringing music to the community. The conservatory will update its curriculum with international training provided by AMPA, while the two organisations will work together on non-profit music and art projects to build a creative education background for students nationwide. This includes bringing music and art education to the school system, giving students places to play music. At the signing ceremony, the two sides also shared that they will work to help not only students but also the community and disadvantaged people access music and have scholarships for musical talents. The two sides will also introduce and popularise performances and organise workshops and master classes for students, as well as exchange lecturers and students via art festivals, performances, competitions and music camps. HCM City Conservatory of Music is one of the three largest professional music training centres in Việt Nam.